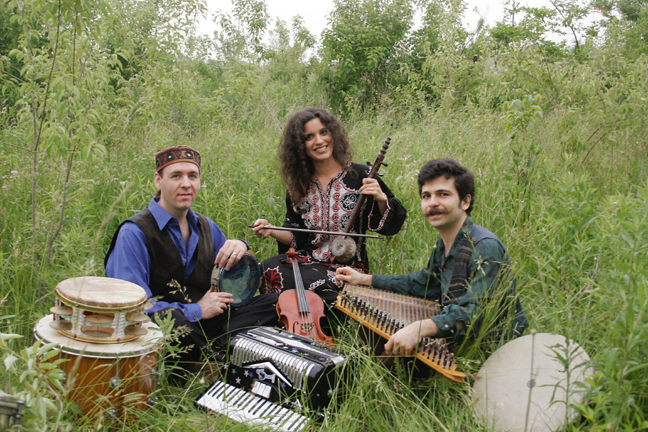 Bloomington, Indiana, may not seem the most likely place for a band that innovates and expands traditional music of Iraq, Turkey, and other countries of the middle east, but that’s just what the members of the band Salaam are doing. 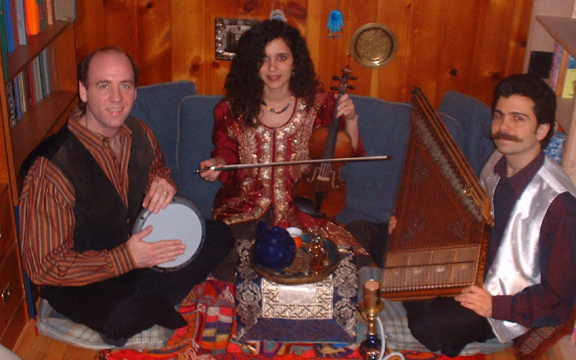 Violinist Dena El Saffar, her husband Tim Moore, who handles percussion on dumbek, riq and a range of other instruments, and her brother, trumpet and saxophone player Amir ElSaffar, along with keyboard and zither master Hakan Toker from Turkey, form the core of the music of the group’s latest release, called simply Salaam. They offer music which sounds both fresh and ancient, taking full advantage of the fact that maqam, the historic middle eastern form on which much of their music is based, lays out tones and intervals with which to evoke emotion but most often leaves rhythm choices up to the players. Several of the pieces on the recording, such as Chobi Party, worked out over an Iraq dance beat with rock bassist John Orie Smith sitting in, are in the moment creations which have the freshness of music you’re sure is never played quite the same way twice. All of their pieces, whether seventeenth century Turkish court music or popular Iraqi song, arise from a deep love and understanding of the traditional roots of this music and these instruments, and a deep commitment to make music that arise from the present day. "When we rehearse traditional Iraqi music, it takes so much concentration and fine tuning of minute details. It's really serious," explains Dena El Saffar, who along with brother Amir, became an active performer of traditional maqam. "The great thing about Salaam, after you learn that serious classical stuff, is that you can relax and have fun. And see what happens! We can be playful, more willing to introduce novel ideas." Those novel ideas spring from days of improvising together, and from unexpected moments in unexpected places. A wild gig at a smoky bar in Terre Haute, Indiana, spurred the unique arrangement of the Iraqi folk song Gulli Ya Hilw, when the crowd went nuts for a driving rock drum set backing the traditional, lovelorn vocals, and started a sing-along. A quieter time spurred the arrangement of Hadha Mu Insaaf Minnek, a romantic song familiar to Iraqis. "We wanted to make it sound like we were sitting around a campfire on a beach," says Moore. "Amir began experimenting with a guitar he had borrowed, and I was playing the dumbek, but trying to channel the bongos." As Amir played the guitar, an uncommon instrument in Iraqi music, he recalled his love for the work of Mississippi Delta bluesman Robert Johnson and wound up creating "a bluesy guitar intro with an Iraqi beat." Dena's search for a deeper connection with her ancestral roots led her as a young woman to Middle Eastern music, an interest soon shared by Amir. Both were trained in Western classical music, and both were soon egging the other on, traveling overseas to find teachers who could further open up the new landscape they sensed on scratchy archival recordings and mysterious cassettes by Egyptians who could squeeze gorgeous quarter tone scales required by maqam out of battered trumpets. Soon Dena, Amir, and Moore became filled with a purpose beyond just playing Middle Eastern music and began to set out to master the rapidly disappearing Iraqi maqam in all its complex, multi-faith, and regionally diverse complexity. "Maqam was the music of any major occasion, even religious ones in Iraq's mosques, synagogues, and churches. The background for all music in Iraq is maqam, whether it's religious or popular," explains Amir. Salaam does not strictly pursue the spirit of pure maqam. That's the goal of the trio's other group, Safaafir, which performed this spring in an international maqam festival in Baku, Azerbaijan. Salaam honors tradition by finding the play between notes, improvising and creating within the traditions they’ve absorbed, and keeping the core of the music all in the family, albeit with a twist: women did not play instruments like the joza (spike fiddle, which Dena plays) traditionally -- at least not in public performances -- making a brother/sister and husband/wife team a new take on old roots. Beyond the family circle, Salaam has also found a way to draw on the cosmopolitan, musically talented resources of their local community in Bloomington. This includes people like band member Toker, who first came to town to attend the conservatory for classical piano, but soon immersed himself in performance art and learning the Turkish qanun (zither), the scholar visiting the university from Tunisia who left behind a love song for the band’s repertoire called Retik, and engineer and mixer Dave Weber, whose work may also be heard on the recordings of Americana and folk-based musicians Carrie Newcomer and Krista Detor. Whether or not you know anything about maqam, the music of the middle east, or spike fiddle, this is a recording worth your listening. In a time when headlines about Iraq are more likely to include news of war than news of peace, the members of Salaam, whose band name means peace, are finding ways to open connections among peoples through sharing their gifts in music. Kerry Dexter is the Music Editor for Wandering Educators. Kerry's credits inclu de VH1, CMT, the folk music magazine Dirty Linen, Strings, and The Encyclopedia of Ireland and the Americas. She also writes about the arts and creative practice at http://www.musicroad.blogspot.com Music Road. You may reach her at music at wanderingeducators dot com. Photos courtesy and copyright of Salaam Band. this is fascinating, kerry - thanks for sharing them! i am heading off to visit their site now.